The new RM 63-02 World Timer from Richard Mille is a timepiece targeted to frequent travellers which is remarkable not only for its appealing look but also for a truly easy to use multi-time-zone mechanism. The desired time zone can be selected by turning the bidirectional rotating bezel until the name of the wearer’s current city is positioned at 12 o’clock: thanks to the graduated 24-hour flange, the RM 63-02 automatically indicates the local time as well as the time in 23 other cities around the world with the blue and white arcs distinguishing nighttime and daytime hours. Like the entire case, the bezel is made in grade-5 titanium with alternating satin-brushed and polished surfaces. Assembled with 12 spline screws in grade 5 titanium, the case is water-resistant to 30 metres and measures 47 mm x 13.85 mm. The crown is enriched by a blue collar made in Alcryn, an advanced material which offers the soft feel of vulcanised rubber while guaranteeing superior abrasion and environmental resistance. A push-button located at 4 o’clock enables the selection of the winding, hand setting and neutral functions. A small aperture located at 4 o’clock displays the function selected: W for Winding, N for Neutral and H for Hand setting. 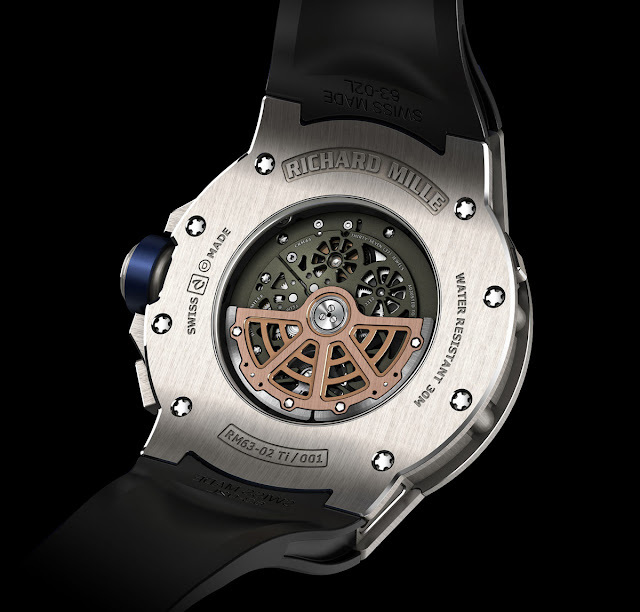 The RM 63-02 also features an over sized date at 12 o’clock driven by two skeletonized calendar discs over a white background. 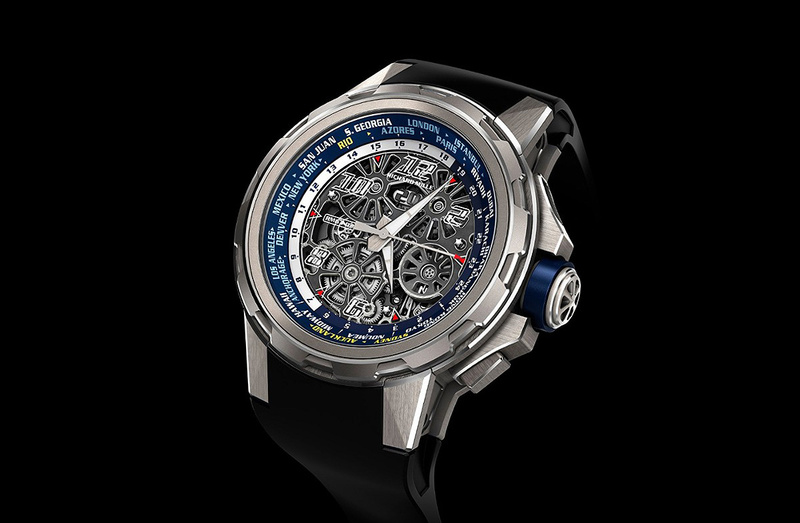 The in-house CRMA3 calibre driving the timepiece is assembled around an electroplasma-treated grade-5 titanium plate for improved rigidity of the entire assembly. The upper bridge, made from black-rhodium-plated, polished and circular-grained nickel silver, provides glimpses of the mechanism in action. Wound by a red gold and grade-5 titanium rotor, the 4 Hz (28,800 vph) movement has a power reserve of 50 hours. 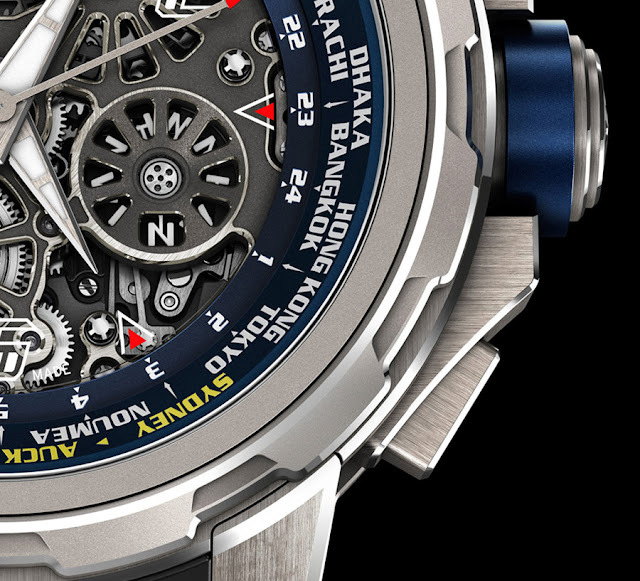 The movement is enhanced by the hand-crafted finishes with many hours of work spent polishing angles, drawing out edges, circular-graining gear trains and microblasting bridges. Richard Mille - RM 63-02 World Timer. 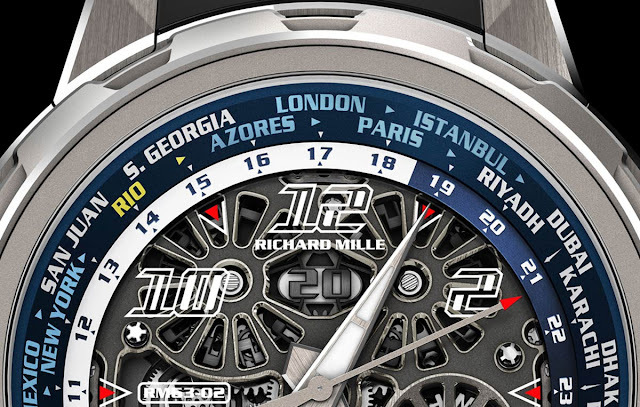 The new RM 63-02 World Timer from Richard Mille is a timepiece targeted to frequent travellers which is remarkable not only for its appealing look but also for a truly easy to use multi-time-zone mechanism. 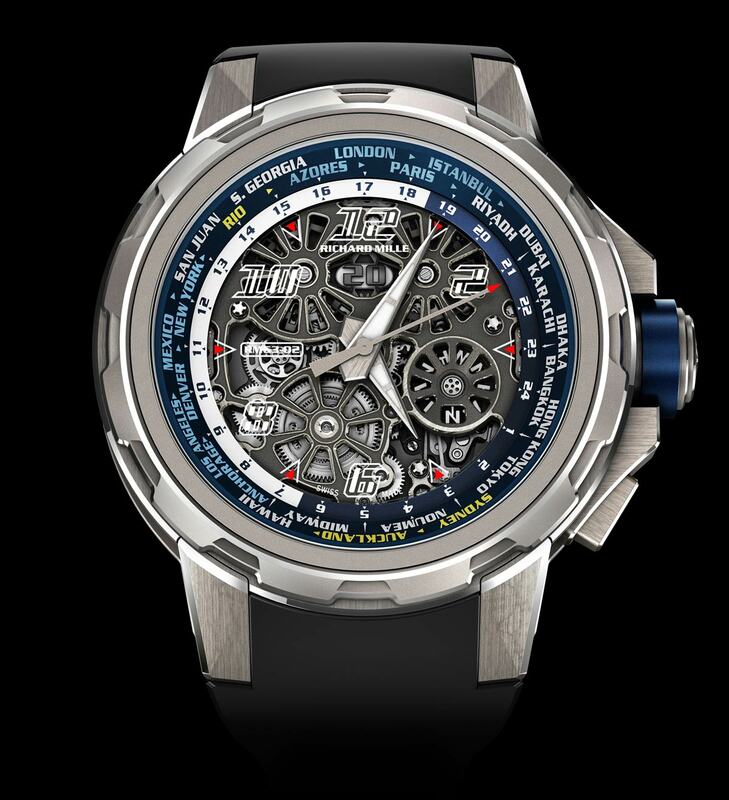 The price of the Richard Mille RM 63-02 World Timer is Euro 148,500 / US$ 145,000.